Hi everyone, Mike Day here, I own Day's Concrete Floors, Inc. 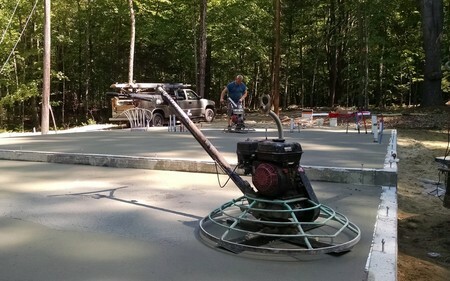 The main part of my business is pouring and finishing concrete floors. 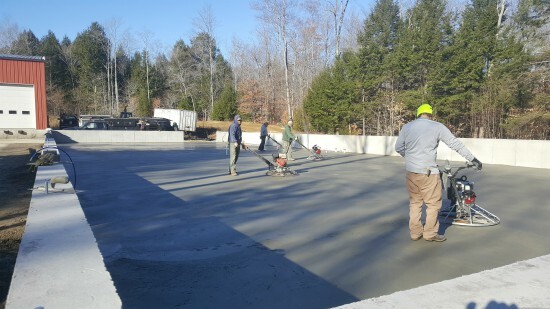 My crew and I pour a concrete floor just about every working day. I really need a power trowel I can count on to trowel my floors day in and day out. Over the years I've used many different brands like Master, MBW, Stone, and Whiteman. I chose the Whiteman Multiquip power trowels for their reliability and ease of use. Now, the other brands have good trowels, I'm not saying they don't. I just prefer the Whiteman's. 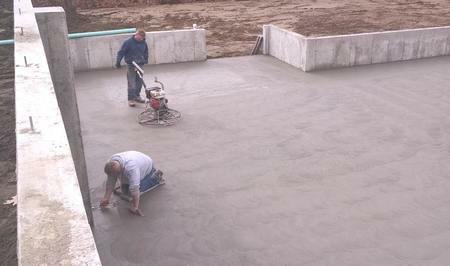 In the photo above my two guys are power troweling a concrete floor using our Whiteman trowels. Both of these are 36" trowels, one has a 8hp Honda motor and the other has a 5.5hp Honda motor. Both trowels do an excellent job at finishing concrete. The motors run smoothly and start on the first pull, the trowels are easy to learn on, easy to control and with proper maintenance, last for years. I have 8 of these trowels from 30", to 36", to 48" wide. A couple of these I've had over 15 years. The concrete floor we're power troweling above is a 5000 sq. ft. concrete floor. As you can see, we have 4 Whiteman power trowels going on this floor. These are a commercial grade power trowel built for all jobs, big and small. 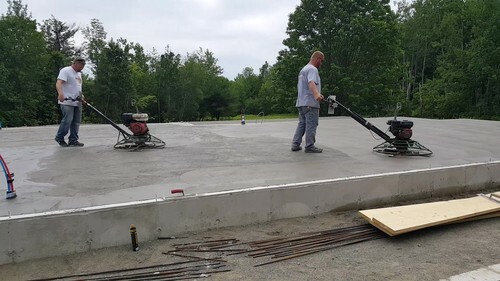 The two jobs above are a house floor (left) and house & garage floors (right) we're power troweling the concrete to what will eventually be a smooth as glass finish. These power trowels make getting a glass like finish really easy. Once you learn how to control the movement of the trowel, it does 90% of the finishing work. If you're interested in purchasing one of these trowels, there's many sites online you can find them. You can also purchase a Whiteman trowel right from Amazon. Disclaimer: I am and Amazon affiliate. If you purchase a product through one of these links, everything about concrete will receive a small commission. Thank you, it helps keep this site going.